That's right ... LORD FINESSE is back in the UK for a list of shows across the country to support his recent vinyl releases on SLICE-OF-SPICE RECORDS. 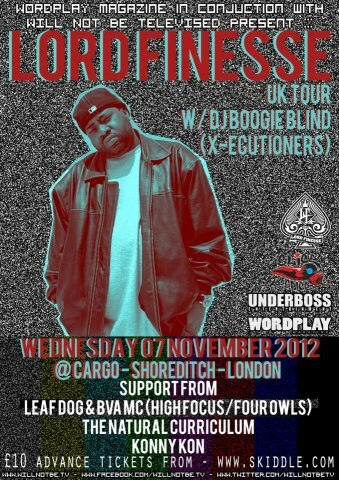 Tomorrow night he will be appearing at CARGO night club in East London with DJ BOOGIE BLIND on turntable duties. You know THE FUNKYMAN is a lyrical master, so get down one of his shows if you wanna hear some of his classic punchlines in the flesh. UK venues for this European tour include Leeds, Glasgow, Norwich and Manchester, but this Sunday FINESSE will be rocking Brighton down on the south coast with my fellow VINYL VETERANS behind the wheels on the night. I believe there will also be a live in-store performance in RAREKIND RECORDS in Brighton but this is yet to be confirmed. This "slick brother with a fade and a half-moon" is not likely to be to touring the UK anytime soon in the near future so this could be your last chance to witness the D.I.T.C. brother without having to purchase a plane ticket. FINESSE getting funky is no co-incidence!